Matthew Upson's late header inflicted a first home defeat on Middlesbrough since the opening day as Brighton moved to within two points of the Championship play-off places. Brighton had chances in the first half as Ashley Barnes' header hit the post. But Boro could have gone ahead when Upson cleared off the line before Lukas Jutkiewicz fired wide. Against the run of play, Brighton then won a disputed corner with Upson heading in four minutes from time. It meant Brighton boss Oscar Garcia won the battle of the Championship's Spanish managers with Aitor Karanka's Boro side now three points above the relegation zone, having won one of their last seven matches. Barnes' early header came amid several opportunities for the visitors, with Middlesbrough goalkeeper Shay Given preventing an own goal by Jonathan Woodgate immediately afterwards. David Lopez could not find a way past Given either. Mustapha Carayol's 20-yard shot was saved by Brighton stopper Peter Brezovan after 26 minutes, and it led to a change in fortunes as Jutkiewicz failed to test the visiting goalkeeper from George Friend's cross. Further chances came and went for Grant Leadbitter, Friend, Carayol and Jutkiewicz. But Brighton snatched the points when Upson connected with a downward header that bounced up and inside the post. "Of course I am angry. We are giving gifts to our opponents in every game. "I can't believe it. It is the same thing again. It is not normal to play so many games when you are probably better than your opponents but you do not get the points. "It is always a lack of concentration. It cannot continue in this way. Here we are again after five games now saying the same things. "All we can do is work hard. The biggest problem though is focus. My hope is that in the next games the players concentrate until the very last minute." "All three points are big, especially in this league. To come away here and get three points is massive. "We had to grind it out. We weren't fluent in anything, we had to shore it up but we made positive substitutions to try and win the game. "Seriously, I cant say how big a win this is. It keeps our momentum going." Match ends, Middlesbrough 0, Brighton and Hove Albion 1. Second Half ends, Middlesbrough 0, Brighton and Hove Albion 1. Offside, Brighton and Hove Albion. Liam Bridcutt tries a through ball, but Leonardo Ulloa is caught offside. Foul by Jacob Butterfield (Middlesbrough). Attempt missed. Curtis Main (Middlesbrough) right footed shot from the centre of the box misses to the left. Assisted by Albert Adomah with a cross. Corner, Middlesbrough. Conceded by Peter Brezovan. Mustapha Carayol (Middlesbrough) wins a free kick in the attacking half. Substitution, Middlesbrough. Luke Williams replaces Rhys Williams. Goal! Middlesbrough 0, Brighton and Hove Albion 1. 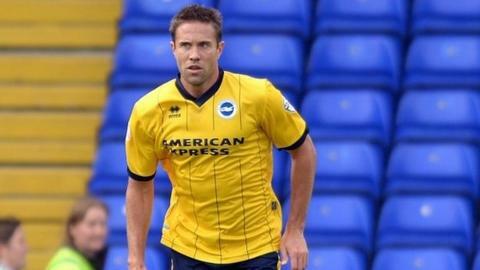 Matthew Upson (Brighton and Hove Albion) header from the centre of the box to the top right corner. Assisted by Craig Conway with a cross following a corner. Corner, Brighton and Hove Albion. Conceded by Dean Whitehead. Substitution, Brighton and Hove Albion. Leonardo Ulloa replaces Ashley Barnes. Corner, Middlesbrough. Conceded by Bruno. Corner, Middlesbrough. Conceded by Adam El-Abd. Craig Conway (Brighton and Hove Albion) wins a free kick on the right wing. Substitution, Brighton and Hove Albion. Íñigo Calderón replaces Stephen Ward. Substitution, Middlesbrough. Curtis Main replaces Lukas Jutkiewicz. Lukas Jutkiewicz (Middlesbrough) wins a free kick on the right wing. Attempt missed. Lukas Jutkiewicz (Middlesbrough) left footed shot from outside the box misses to the left. Assisted by Dean Whitehead. Attempt missed. Lukas Jutkiewicz (Middlesbrough) header from the centre of the box misses to the left. Assisted by Mustapha Carayol with a cross following a corner. Corner, Middlesbrough. Conceded by Liam Bridcutt. Attempt missed. Lukas Jutkiewicz (Middlesbrough) header from the left side of the six yard box is too high. Assisted by Albert Adomah with a cross. Jacob Butterfield (Middlesbrough) wins a free kick on the right wing. Substitution, Brighton and Hove Albion. Kazenga Lua Lua replaces David López. Attempt saved. Mustapha Carayol (Middlesbrough) right footed shot from the right side of the box is saved in the centre of the goal. Attempt missed. Grant Leadbitter (Middlesbrough) right footed shot from more than 35 yards is high and wide to the right. Assisted by Jacob Butterfield. Corner, Brighton and Hove Albion. Conceded by Shay Given.